Roll Over Protection System (ROPS) – The practical foldable ROPS protects the user and can be lowered in areas with low-hanging branches. Cast Iron Spindle Housings – Bold cast iron blade housings built for durability and featuring sealed ball bearings. Commercial drive system – Hydro-Gear’s ZT3400 series commercial transmissions are fully serviceable and offer higher ground speeds with smooth performance. Pedal-assisted cutting deck lift – Ergonomically designed deck lifting system offers precise cutting height adjustment. Easy and quick adjustment from the operator’s seat. Comfortable operation – Convenient seat slide with spring suspension, large dampened steering levers with premium foam grip and multiple control lever adjustments for operator preference. Adjustable steering levers – Steering levers are adjustable for different size operators – ergonomically angled inward for more comfort and can be adjusted to suit your particular style. Easy-access service points – Oil and filter maintenance, hydraulic drive system components/adjustment, electrical system and battery are all within easy reach so you can quickly get back to being productive. Premium seat – Thick cushions and EVC (elastomeric vibration control) provide unsurpassed comfort for the operator. The two tone vinyl covers are replaceable in the event of damage. 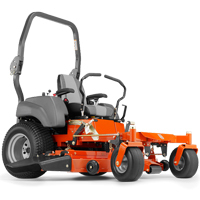 Zero-turn steering system – Individual, hydraulic wheel-drive provides very precise maneuvering and allows the mower to rotate around its own axis, without any turning radius. 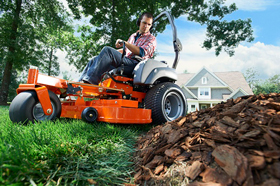 Endurance Commercial Engine – Husqvarna’s Endurance Commercial engines provide extended life with features like cyclonic air filtration, heavy duty starting systems, cooler running cylinder heads and improved crank support. Fuel tank volume (with reserve): 5 gal.